A great infographic on calculating Lifetime value, using Starbucks as a casestudy. We want to be wherever consumers are. It’s no longer digital marketing. It’s marketing in a digital world. I’m sure there are a few ways to do it, however this expression worked very well for me. EasyJet and Ryanair are competing budget airlines in the European and UK market. Both airlines have similar pricing and service; however the websites operate completely differently. Which airline has the better website? Whilst living in London for the past two years I have been a frequent visitor to both websites. I would say that I am one example of EasyJet and Ryanair’s target audience groups. I am a frequent traveller (flying 1-3 times a month) and I am also interested in travelling on the cheap, so I mostly consider budget airlines when booking my flights. As a consumer, I want to see all of this information on a website as easily as possible to make the best decision and ultimately purchase. So, how does this translate in terms of the EasyJet and Ryanair website? For this study I have chosen Berlin as the destination, with the reason being it is quite a well visited and popular destination in Europe. The dates chosen are Friday 16th August – Sunday 18th August 2013. The August period is summer in London/Berlin so it will be the peak travel period. I have also chosen to leave on Friday and to return to London on Sunday as I often took weekend trips and left on a Friday night after work. In my experience of travelling over the last two years, Friday nights and Saturday mornings are very busy periods at the airports. Please note that this analysis is not an all inclusive study of usability on both websites (it does not factor in design and programming functionality), but rather focuses solely on the main tasks of a user and how easy it is to perform the tasks on both EasyJet and Ryanair websites. 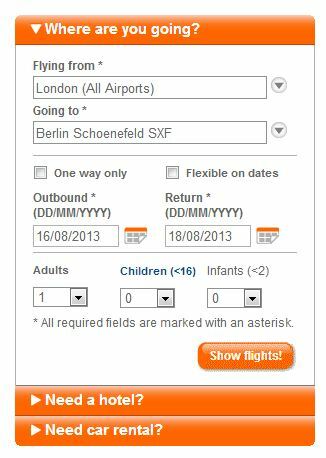 EasyJet has a simple to use interface on the homepage. I like that the search option allows me to search for all airports in London. This is especially useful for users that are flexible with airport location and would rather focus on price/timings of flights. It also allows users to search for specific airports and tailors its search functionality to both searching habits. After hitting the ‘Show Flights’ button, I am taken to the flight selection page. This is an easy and quick process. Ryanair’s flight search interface on the homepage looks simple enough, however looks can be deceiving and this is a prime example. I search for London and am shown three individual airports in the auto-complete. I choose the first option, London Gatwick, as this airport is the most convenient to get to from my work on a Friday afternoon. However, when I search for Berlin, no auto-complete options are shown. I chose the dates and click ‘Book Now’ anyway hoping that some results return. I then get a popup stating that I have not chosen my destination. As a user I am a bit stumped. I have most certainly chosen a destination and I find it frustrating that it is telling me otherwise. After a short while I realise that I have chosen the wrong airport and that I will need to select another London airport that actually flies to Berlin. 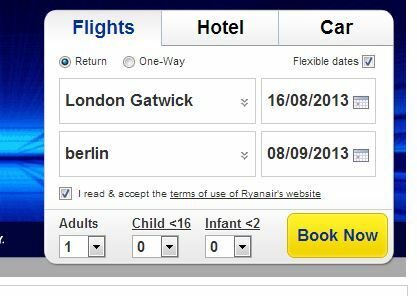 This is where Ryanair’s search functionality fails. It assumes that customers know which airports are connected to certain destinations. In the end I had to go through each London airport in the search function to see if the Berlin destination would show up on auto-complete. This has tested my patience and as a user, I could have easily given up booking with Ryanair based on this inconvenience alone. After finally finding that London Stanstead connects to Berlin, I click ‘Book Now’ and I am then taken to a security check page where I have to fill in a CAPTCHA form. I can understand that Ryanair does not want to be spammed by bots, but as a user I just see this as another hindrance and hurdle I have to jump over to get to the flight selection page. This whole process has taken me about 5-10 minutes, compared to the 1 minute it took on the EasyJet website. There is definitely a clear winner here. EasyJet’s easy selection and one-click process out shadows Ryanair’s difficult to use interface. In the future it would be great to see Ryanair adopt a ‘search all’ functionality for all London airports and also to remove the CAPTCHA form as it is an unnecessary additional step in the booking process. I would also consider removing the tickbox for the terms and conditions on the Ryanair search form. In the next series, I will analyse the ease in which I can compare flights and costs and also assess the conversion funnel on both EasyJet and Ryanair websites. If you have come across a website that oozes great or poor usability, please leave a comment! I often spend around 2 hours+ a day looking at digital marketing material (including outside of work). Have you come across anything interesting lately? Recently I have seen a lot of advertisements (on television and also video ads at tube stations around London) for Internet Explorer 9 and Chrome browser. Here is a popular ad on IE9, that seems to be popping up everywhere around London. Microsoft’s use of music is catchy. The combination of graphics and preview of different mediums appeal to a younger audience. Microsoft focuses on the features and the benefits of IE9, such as the speed. They also touch on what you can do with the browser such as watching videos and playing games. 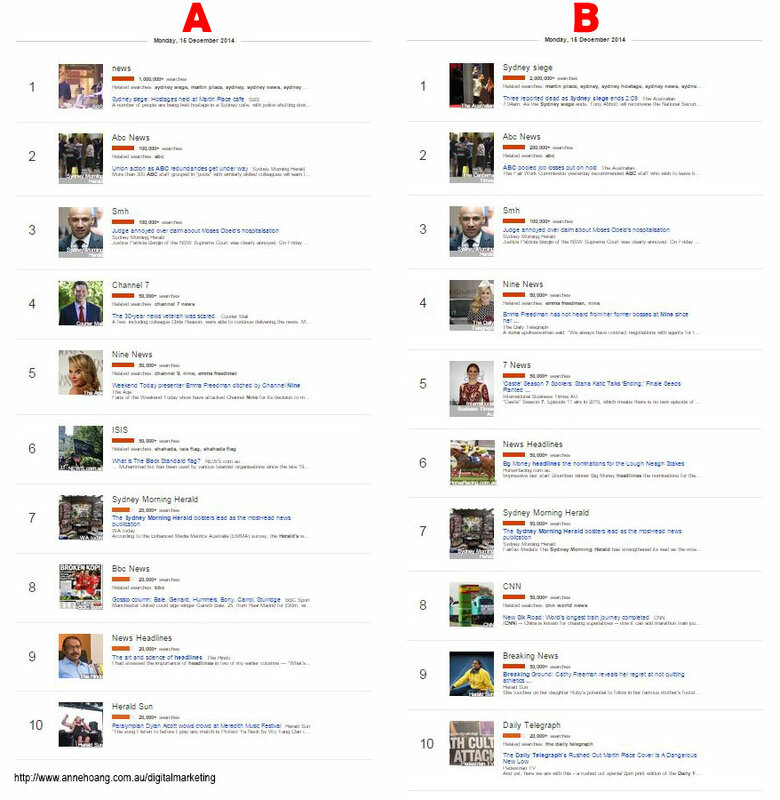 The reviews from trustworthy sources, like New York Times, also help build credibility. Chrome’s ad below takes on a very different approach. The ad tells a story and follows the timeline of Julie Deane’s success with creating and growing her satchel bag business. The main messaging of the ad is why you should use chrome and how you can use it to achieve your goals. Although the ad showcases specific Google products (such as Gmail, Google Chat, Google Maps, Youtube and Google Search), they do it in such a clever and seamless way that you don’t even really notice. The ad is also very localised – the ad was made for the UK audience and uses a case-study of a successful business woman based in the UK. The tagline is ‘the web is what you make of it’ and they have also skilfully included a call to action at the end – ‘search for chrome’. So who do you think does it better? Google’s clean and simple ad with the messaging of why and how you can use Chrome to achieve your goals or Microsoft’s youthful and catchy ad focussing on the features? For me, there is a clear winner here. Google’s focus is on the ‘why’, whereas Microsoft focuses on the ‘how’ and ‘what’. The ‘why’ drives more meaning into not only the product but the business as a whole, and to that extent will help Google grow a loyal following. However, it really comes down to one question, why should I use this product? Microsoft’s answer via the ad: We are fast, fluid and have high definition. We are also endorsed by several reputable companies. Google’s answer via the ad: We can bring your ideas to life and help reach your goals. Which answer appeals to you most? Recently I held a training session to show people from other departments how to use Google Analytics to pull various reports. A person from the marketing team (that dealt mostly with offline media such as magazine and newspaper inserts) asked about how they could measure the effect of their offline advertising through online analytics. Measuring offline activity is no easy fete. However there are ways to give data more meaning. The ‘annotations’ feature in Google Analytics allows you to leave notes (private or public) on the graphs. This allows you to gain an understanding of unusual spikes in traffic. For example, below I have set up an annotation on June 17 2012 which shows a spike in traffic to this specific page. The reason for the spike, as noted in the annotation, is because the summer banner campaign was made live that day which brought in an increase in traffic. Setting up annotations in Google Analytics is a great way to keep track of not only online marketing activity but also any changes you’ve made on the website, such as new blog posts. Although Google Analytics is an online measurement tool, it is also worth noting offline activity, such as TV commercials and press coverage, to see if the offline activity directed any traffic to the website. Recently I have been involved in a few e-mail projects – most notably analysing and optimizing emails. Research has shown that e-mail drives a higher conversion rate than both search and social efforts. If you have a database full of engaged users that have signed up for your newsletters or promotions, optimizing your emails is definitely a worthwhile activity that could lead to more sales and a higher conversion rate. What is email optimization? How do I do it? For those that are not in the digital marketing industry, the words ‘optimizing’ and ‘optimization’ might just sound like buzz words. In this scenario, optimizing simply means improving e-mails (through various methods) so that consumers are more likely to perform your desired action, such as purchasing a product, liking your Facebook page and so forth. Optimizing emails can involve testing a number of variables and analysing the results. When creating a test, it is good to have a goal in mind. For example, the next email I send out I want to increase Open Rates. From that goal, you can then expand to test different aspects such as subject lines, scheduling etc. I have created a diagram below to show the different variables that you can test. This diagram is not all inclusive, it is designed to give you an idea of different goals and variables you could test to reach your goal. In part 2 of ‘How to optimize emails’ I will look at multivariate testing and recording results. This a common question in the screening and interview process. It can also be a very tricky question as some recruiters will try to weed out candidates that have a high salary expectation. On the other end, I have also heard of people refusing to answer this question till after they have had an interview. In the past I’ve had trouble answering this question and usually base my answer around my previous salary only. I’ve had a think about this question more and did a bit of background research. I found some salary averages on Reed for the Media, Digital & Creative industries and it states that that average salary is £35,272 for search positions (SEO & PPC) in the UK. I’ve also had a conversation with a recruiter and she stated that a base salary in an agency is usually around the £35k mark for a mid-senior level position. Of course there are other ways you could go about it. Are there any other factors that you would look at while answering this question?